We finally moved in! On Friday, we were informed that we could move into the apartment we were supposed to move into June 1 on Monday. We spent the weekend packing, scheduling movers and changing over our utilities. The actual move was pretty seamless. 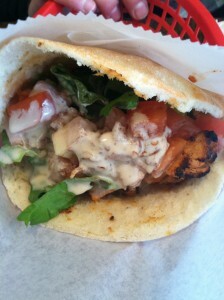 While the movers trucked our apartment from 1st Ave to Avenue B, we stopped for lunch on our new block at Cafe Rakka. The inside of the cafe could use a makeover but the food was delicious. Street meat inside a cafe. 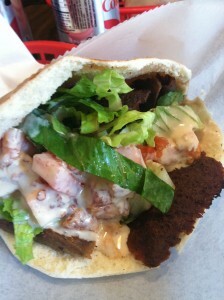 I’ll definitely be back to try their famous falafel.